Ahh, ancient Greece. Hot nymphs, raging orgies, much wine, song, and occasional transformations into a goat. All well and good, right? 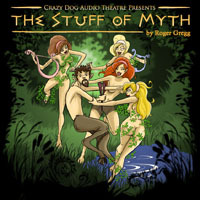 Well things are more wacky than ever in the sizzling and scandalous interpretation of the myth of Orpheus done by Roger Gregg, The Stuff of Myth. This great production won a Gold Ogle in 2007 and has gotten rave reviews as a stage play. Now hear what the buzz is all about in Parts 1-2 of The Stuff of Myth.